When I first met the ladies of Transitions Estate Services, they had a simple problem. They needed a way to get their sale notices to their customers by email. We set them up with a bulk email system and template and decided to use Pinterest as a way for them to show off the items at each sale. Updating their website frequently was not practical for them. Pinterest turned out to be a great option for images of the sale items and their click-through and open rates have been amazing since the very first issue. Average open rate is 43% with a high of 46%. Compare this to a 20% industry standard and you can see how successful it has been. Average click-through rate is 27% with a high of 33%. For each and every send, the most clicked link is their Pinterest board and the second is the map to location. Just what they were looking for... to show customers the items for sale and have them show up at the sale! 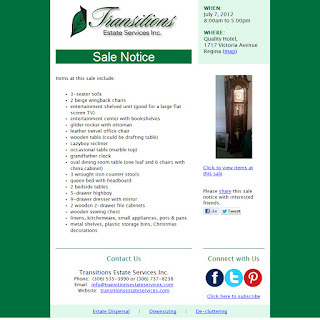 Their customers can see the sale notice and list of items in the local paper but when they receive the sale notice in email, they can click through to the images of items as well. This is not possible with print media without the big expense of publishing pictures with the ad. Even then, they would be limited in what they could publish, where Pinterest allows them to post as many images per sale as they want. If you are doing anything visual in your business, see what happens if you add Pinterest to your email marketing campaign. Readers love to have something to look at. It makes them connect on a new level.